Famous Norwegian playwright Henrik Ibsen compared the identity of any people with that of an onion composed of multiple layers. Based on this concept, coming from one of the greatest literary European minds in modern times, the Egyptian identity is similarly constructed from many different layers. Some of these layers originated in Ancient Egypt and its civilization of 30 centuries. Other layers come from its Coptic era, when Egypt was an entirely Eastern Christian society. Countless layers also come from the Islamic and Arabic speaking Egypt. Several more layers stem from the modern Egypt established by Mohamed Ali, who ruled Egypt between 1805 and 1848, a state which lasted for a bit more than a century after his death. And finally come the multiple layers produced by Egypt's geographical location as a generally Mediterranean society, and more specifically as an Eastern Mediterranean society. This complex configuration is based upon undeniable historical and geographical fact. It contains no contradictions. Only simplistic thinking would find contradiction in such complex phenomena. This rich and wonderful Egyptian identity, loaded with the fruits of cross- fertilization between varied cultures and civilizations, is presently the subject of a systematic destruction of its constituent elements. Its unique richness and plurality poses a threat to other surrounding societies suffering from a severe lack of such variety. While the Islamist movement, which is now thrilled to harvest the seeds it has sown in Egypt, is among the realities of the Egyptian society, it represents a grave threat to the complexity and plurality of the Egyptian identity. The prevalence of conservative schools of thought among most present day Muslim minds (as seen in the thinking of Ibn Hanbal, Ibn Taymiyya, the Wahabi movement, and the rest of the Salafi trends) is ominous. It makes the possibility of spreading a wave of animosity towards the non-Islamic dimensions of the Egyptian identity imminent. It is enough to note what some say of the monuments of Ancient Egypt, which are one of the greatest ever among all human civilizations. (Salafi leaders such as Abdel-Moneim El-Shahat, who was narrowly defeated by a Muslim Brotherhood candidate in Alexandria, repeatedly suggested that Egypt's Pharaonic treasures should be either destroyed or covered with wax because they were "statues banned by Islam.”) Parallel to that, the existence of “anti-other” values, no matter who this “other” might be, is very possible and very dangerous for an Egyptian identity which is based on plurality. What I fear the most is that the political movement will change school curricula in a way that highlights the Arab Islamic dimension alone, while destroying all others. This destructive scenario is not that farfetched with the existence of a parliamentary majority of this school of thought now taking over the education committee. As expected from all theocratic entities, they will mostly focus on the Arab Islamic component of the Egyptian identity. It is sad to note that this trend of aiming to serve a single dimension has already started many years ago with the religious (Islamic) thought taking over those in charge of education in our society. For example, the Arabic language and literature curricula, instead of offering brilliant literary texts of great minds such as Ahmed Lotfy Elsayed, Taha Hussein, Al Aqqad, Al Mazni, Salama Moussa, Tawfiq Al Hakim, Naguib Mahfouz, Youssef Edris, Nezar Qabbani, Al Sayab, Michael Naema, and many others excluded them. That transformed the curricula into religious texts to a point where it becomes hard to distinguish whether they are dealing with Arabic language and literature or Islamic texts. Lebanese intellectual Amin Maalouf describes any single dimensional identity as a fatal one. His is an accurate and precise description; such a single dimensional identity in our time will very like collide with the values of pluralism and the acceptance of the “other” and the critical mind, let alone its contrast with the idea of our common humanity. I would say to those who repeat “this is the will of the people,” that it was also the will of the German people that brought Hitler to power in Germany eight decades ago, which took a devastating toll on humanity, destroying the lives of more than 50 million people. 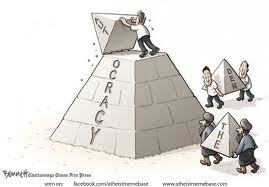 This example allows us to criticize the current state of the Egyptian culture which threatens the non-Islamic components of the Egyptian identity, and could easily transform us into a single dimensional society (just like the societies of sand around us), even if we’ve come to where we are because of the popular will. Wrong (as Voltaire said) remains wrong, even if repeated a million times. * This article was translated from Arabic into English by Mohamed Shedou and revised and edited by Sharon Bussell. The Arabic version was published by the Egyptian daily al-WAFD on 18th April, 2012.